Many types of glue adhere glitter to glass, but choosing a less-than-ideal adhesive may result in a bumpy opaque mess rather than the sparkly glass embellishment you expected. For optimal results, choose a glue designed to dry clear and thin on glass, such as a decoupage medium or special glitter-and-glass adhesive designed for crafting. A fine craft glitter also yields a smoother, more elegant result than chunky, large glitter. Clean the area of the glass you wish to decorate using either rubbing alcohol or white vinegar. Apply the chosen cleaning substance to a cotton ball or lint-free cloth, then rub the cotton or cloth over the glass until it looks clean and clear. Cleaning it removes greasy residues and fingerprints that may otherwise end up trapped on the glass under the glue and glitter. Mask off areas you do not wish to decorate, such as the top of a wine glass, using painter's tape. If using a stencil, tape it down over the glass project piece so the stencil rests completely against the glass. Cover the work surface with a sheet of newspaper to help protect the table and to catch stray glitter. Squirt a small pool of glue onto a disposable plate. Use enough glue to apply a thin layer of glue over all the areas you wish to cover with glitter. Dip a foam stenciling pouncer into the glue, then dab it over the glass in your chosen areas. If using stamps to create the designs, dip the stamp or stamps into the glue, then dab it onto the glass in the desired areas. Re-dip the stamp after each time you press it against the glass, or reload the pouncer with more glue, as needed. Pouncing, rather than painting, the glue on results in a smoother coat. Pour a small amount of glitter immediately over all the wet glue areas, using the glitter vial to dispense the glitter. If the glitter is in an unwieldy container, use a piece of paper to control glitter portions instead. Fold a piece of scrap paper in half and create a bold crease. Pour the glitter onto the paper, fold the paper and use the creased area as a spout. Shake or tap off excess glitter on the glass, then apply more glitter until the piece has the desired amount of glitter coverage. Allow the glass to dry completely. If not completely confident about how your glitter design will turn out, practice with the glue and glitter on scrap paper or on an inexpensive drinking glass, for instance. This allows you the opportunity to get a feel for applying the glue. Painter's tape may be used to create a cutaway stencil for a pattern such as zebra stripes. Cover the entire decorating area with painter's tape, draw your design atop the tape, then cut away the areas you wish to cover with glitter using a craft knife. Work the knife with a light touch to avoid scratching the glass. Apply the glue and glitter to the cut-away areas. Pour excess glitter back into the container by folding the newspaper to create a spout, slowly tipping it over the glitter container. 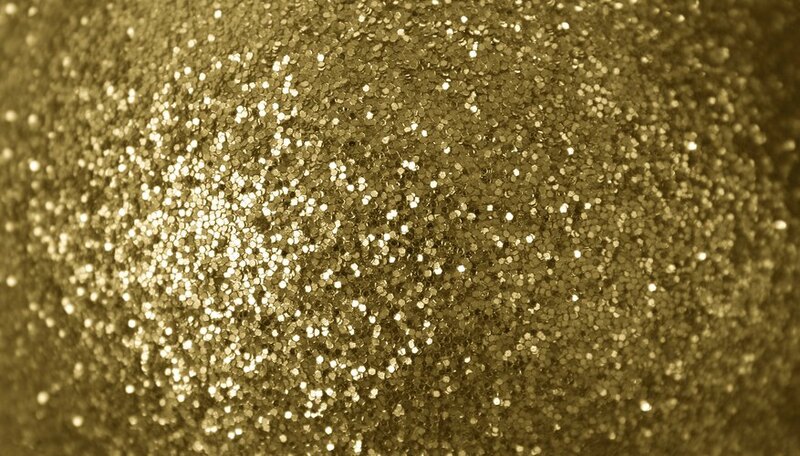 Do not use glitter atop surfaces used for food or drink, such as on top of a glass plate or around the rim or inside of a wine glass. Instead, apply the glitter to the outside of the object so it is not accidentally ingested. How to Find Out If a Glass Mirror Is Antique?